If you are interested in Charter Yacht Ownership, then by now you have likely been introduced to our Owner Privilege Table. This is the table that our owners can reference as it relates to destinations, our points system, and when high season and low season occurs. If you have not yet seen our owner usage point matrix, click the button below to fill out a simple form to instantly download it. But what does it all mean? Understanding how the point system works with regards to your owner's time when you own a yacht through Sunsail can, at first glance, seem complicated. But we are here to tell you that with just a little guidance it is all quite simple to comprehend! How Many points do I get each year? Each calendar year, owners get 42 points of advanced booking and 42 points of short notice booking. To understand what defines "short notice" you will see the columns all the way to the right of the graph explain what determines short notice for each destination. If you look at the Owner Privilege Table you will see that there is high season, as indicated by the dark blue, and low season, as indicated by the lighter blue. In high season, owners will use two points per day, and in low season owners will use one point per day. What this means is that if you booked all of your time in low season you could spend 12 weeks per year on your yacht and sister ships. Sunsail does not have any blackout dates, so our owners are free to use their points any time of year, including Christmas and New Years. What are all the destinations that I can use sister ships at? If you glance at the left hand column of the Owner Privilege Table, you will see all of the countries and the bases in which you would have reciprocal use of your boat or a sister ship. For example, if you owned a boat in Belize you would have full reciprocal use of the similar size and group boat in the Bahamas, the BVI, Croatia, Greece, Thailand, Tahiti and all of the countries listed on the left hand column on your owner privilege table. You will notice that bases for both Sunsail and The Moorings are listed on the Owner Privilege Chart. As a Sunsail Owner, you may book a Moorings yacht of similar size and group, but you must pay a cross brand fee of $500 each time you charter a boat with The Moorings. How can I tell when high season and low season is for each base location? Along the top of the owner privilege table, you will see the dates written out January - December. As we briefly mentioned earlier, high season is indicated by dark blue, and low season indicated by light blue. In the Caribbean, including BVI, St. Martin, St. Lucia, Grenada and Belize, you will note that high season occurs December 16th – April 15th and during this time owners will use two points per day. Additionally, in the light blue, throughout the year you will see that low season in the Caribbean is April 16th- December 15th . If you charter during these dates in the Caribbean, you would be using one point per day to charter. For the Mediterranean destinations you will see a gray column which indicates that the bases are closed during this time due to the cold climate. The Mediterranean bases are closed December 1st – February 28th. If you need any more information or explanation on how our point system works, contact us today. 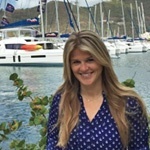 Laura grew up in Miami and spent her early summers at sailing camp on Miami Beach and in the Florida Keys, and has been lucky to find ways to travel and be on boats frequently throughout life. Never forgetting her incredible first sailing trip around the BVI in 2004, she was thrilled to join the Moorings & Sunsail Yacht Ownership team in 2013. She is happy to answer all questions about the program and available yachts in English and Spanish.